Sumter County, South Carolina, U.S. The United States Army Central, formerly the Third United States Army, commonly referred to as the Third Army and as ARCENT is a military formation of the United States Army, which saw service in World War I and World War II, in the 1991 Gulf War, and in the coalition occupation of Iraq. It is best known for its campaigns in World War II under the command of General George S. Patton. Third Army is headquartered at Shaw Air Force Base, South Carolina with a forward element at Camp Arifjan, Kuwait. It serves as the echelon above corps for the Army component of CENTCOM, US Central Command, whose area of responsibility (AOR) includes Southwest Asia, some 20 countries of the world, in Africa, Asia, and the Persian Gulf. On 15 November 1918, Major General Dickman was given the mission to move quickly and by any means into Central Germany on occupation duties. He was to disarm and disband German forces as ordered by General John J. Pershing, commander of the American Expeditionary Forces. The march into Germany for occupation duty was begun on 17 November 1918. By 15 December the Third Army Headquarters at Mayen opened at Coblenz. Two days later, on 17 December 1918, the Coblenz bridgehead, consisting of a pontoon bridge and three railroad bridges across the Rhine, had been established. Third Army troops had encountered no hostile act of any sort. In the occupied area, both food and coal supplies were sufficient. The crossing of the Rhine by the front line divisions was effected in good time and without confusion. Troops, upon crossing the Rhine and reaching their assigned areas, were billeted preparatory to occupying selected positions for defense. The strength of the Third Army as of 19 December, the date the bridgehead occupation was completed, was 9,638 officers and 221,070 enlisted men. 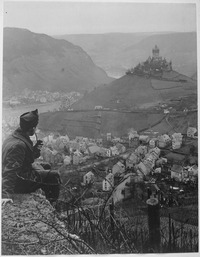 "This old castle perched on a hilltop above the Moselle River and the town of Cochem, Germany, is headquarters of the U.S. Fourth Army Corps. In foreground is Cpl. James C. Sulzer, Fourth Army Corps, Photo Unit. January 9, 1919." On 12 December, Field Order No. 11 issued, directed the Third Army to occupy the northern sector of the Coblenz bridgehead, with the advance elements to cross the Rhine river at seven o'clock, 13 December. The northern (left) boundary remained unchanged. The southern (right) boundary was as has been previously mentioned. Before the advance, the 1st Division passed to the command of the III Corps. With three divisions, the 1st, 2d, and 32d, the III Corps occupied the American sector of the Coblenz bridgehead, the movement of the troops into position beginning at the scheduled hour, 13 December. The four bridges available for crossing the river within the Coblenz bridgehead were the pontoon bridge and railroad bridge at Coblenz, the railroad bridges at Engers and Remagen. On 13 December the advance began with the American khaki crossing the Rhine into advanced positions. On the same day the 42d Division passes to the command of the IV Corps, which, in support of the III Corps, continued its march to occupy the Kreise of Mayen, Ahrweiler, Adenau, and Cochem. The VII Corps occupied under the same order that portion of the Regierungsbezirk of Trier within army limits. On 15 December, Third Army Headquarters at Mayen opened at Coblenz: III Corps Headquarters at Polch opened at Neuwied and IV Corps Headquarters remained at Cochem, with the VII Corps at Grevenmacher. In crossing the Rhine on the shortened front—from Rolandseck to Rhens on the west bank—the Third Army encountered no hostile act of any sort. In the occupied area both food and coal supplies were sufficient. By the night of 14 December, Third Army troops had occupied their positions on the perimeter of the Coblenz bridgehead. During January 1919, the Third Army was engaged in training and preparing the troops under its command for any contingency. A letter of instruction was circulated to lower commanders prescribing a plan of action in case hostilities were resumed. Installations were set up throughout the Army area to facilitate command. In February, military schools were opened through the Third Army area; a quartermaster depot was organized; 2,000 officers and enlisted men left to take courses in British and French universities; better leave facilities were created; and plans for sending American divisions to the United States were made. On 4 February, the military control of the Stadtkreis of Trier was transferred from GHQ to the Third Army. In March, routine duties of occupation and training were carried on; an Army horse show was held; Army, corps, and divisional educational centers were established in the Third Army Zone; the Coblenz port commander took over the duties of the Coblenz regulating officer; and the 42d Division was released from IV Corps and was placed in Army Reserve. In April, the exodus of American divisions from Third Army to the United States began. During the month, motor transport parks were established; an Army motor show was held; the Army area was reorganized; and the centralization of military property was initiated in anticipation of returning it to the United States. On 20 April 1919, Third Army command changed from Maj. Gen. Dickman to Lt. Gen. Hunter Liggett. On 14 May 1919, Marshal Ferdinand Foch, General-in-Chief of the Allied Armies, submitted plans of operations to the Third Army commander to be used in the event that Germany should refuse to sign the peace treaty. On 20 May, Marshal Foch directed allied commanders to dispatch troops toward Weimar and Berlin in the event the peace treaty was not signed. On 22 May, the Third Army issued its plan of advance, effective 30 May, in view of the impending emergency. On 27 May, Foch informed Pershing that the Supreme War Council desired allied armies be made ready immediately to resume active operations against the Germans. On 1 June, the advance GHQ, AEF, at Trier was discontinued. On 16 June, Foch notified Pershing that allied armies must be ready after 20 June to resume offensive operations and that preliminary movements were to begin 17 June. On 19 June, Pershing notified Foch that beginning 23 June the Third Army would occupy the towns of Limburg, Westerburg, Hachenburg, and Altenkirchen, and that III Corps would seize the railroad connecting these towns. On 23 June, the Germans signified their intention to sign the peace treaty and contemplated operations were suspended. On 30 June, Foch and Pershing conferred about the American troops to be left on the Rhine. On 1 July, General Pershing notified the War Department that upon Germany's compliance with military conditions imposed upon her (probably within three months after German ratification of the treaty), the American forces in Europe would be reduced to a single regiment of infantry supplemented by necessary auxiliaries. Accordingly, the Third Army was disbanded on 2 July 1919. Its headquarters and all personnel (numbering about 6,800 men) and units under it were thereafter designated American Forces in Germany. This force would remain in Germany for over three years. This was due, at least in part, to the fact that the United States, having rejected the Treaty of Versailles, was therefore still "de jure" at war with Germany. This situation remained unresolved until the summer of 1921 when a separate peace treaty was signed. 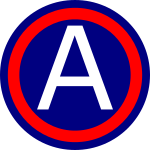 The Third Army was reactivated on 9 August 1932, in a reorganisation of field forces in the United States, as one of four field armies, the Third Army among them, were activated, to control the units of the U.S. Army that were stationed on home soil. Until the buildup of American forces prior to its entry into World War II, the Third Army remained largely a paper army. It held training exercises periodically, but these were almost never adequate. Mobilization saw the Third Army take on the role of training some of the huge numbers of recruits that the draft was bringing into the United States Armed Forces. Lieutenant General Walter Krueger, later to gain fame for his command of Sixth Army during operations in the Pacific, commanded Third Army from May 1941 until February 1943. Under his leadership, the basis of the Army's later success as a combat formation was laid. Krueger was succeeded by Lieutenant General Courtney Hodges who led the Army for the rest of 1943. The news that many had expected came in December 1943 and the Third Army was shipped from the United States to the United Kingdom. Third Army did not take part in the initial stages of Operation Overlord. However, when it did take the field, its field of combat suited the style of its commander. Lieutenant General George S. Patton was one of the U.S. Army's greatest exponents of armored warfare. When Third Army was moved to France, it was just after Omar Bradley's formations had achieved the breakout from Normandy. Third Army followed up on that success and began a great dash across France. It was only the inevitability of logistics problems that halted Patton's force near the borders of Germany. After a period of consolidation, Third Army was ready to go on the offensive again. However, the Germans then launched their last great offensive of the war – the Battle of the Bulge. This battle was an attempt to repeat the decisive breakthrough of 1940. However, in 1944, the Germans were doomed to failure. Their own logistical problems surfaced, and they ground to a halt. Nevertheless, they had broken the U.S. front, and it took a great effort to reduce the resulting salient. In one of the great moves of the war, Patton turned Third Army's axis of advance through ninety degrees and set it upon the south of the German forces. The German salient was reduced by the end of January 1945, and the remainder of the process of closing up to the Rhine could be completed. Some vicious fighting took place, but by April there was but one great natural barrier between Third Army and the heart of Germany. Unlike in 1918, the crossing of the Rhine was opposed. However, the bridgehead was won, and Third Army embarked on another great eastward dash. It reached Austria and in May liberated the Mauthausen-Gusen concentration camps complex. Its forces ended up in Czechoslovakia, the furthest east of any American units. The Third Army After Action of May 1945 states that the Third Army captured 765,483 prisoners of war, with an additional 515,205 of the enemy already held in corps and divisional level POW cages processed between 9 May and 13 May 1945, for a total of 1,280,688 POWs, and that, additionally, Third Army forces killed 144,500 enemy soldiers and wounded 386,200, for a total of 1,811,388 in enemy losses. Fuller's review of Third Army records differs only in the number of enemy killed and wounded, stating that between 1 August 1944 and 9 May 1945, 47,500 of the enemy were killed, 115,700 wounded, and 1,280,688 captured. Fuller's combined total of enemy losses is 1,443,888 enemy killed, wounded, or captured by the Third Army. The Third Army suffered 16,596 killed, 96,241 wounded, and 26,809 missing in action for a total of 139,646 casualties according to the aforementioned After Action Report of May 1945. According to Fuller, the Third Army lost 27,104 killed and 86,267 wounded. There were 18,957 injuries of all kinds and 28,237 men listed as missing in action. To include 127 men captured by the enemy, brought total casualties of the Third Army to 160,692 in 281 continuous days of operations. Fuller points out that the ratio of German troop deaths to American deaths in the Third Army operating area was 1.75:1. Occupation beckoned again, and Third Army took up the challenge of starting to rebuild postwar Germany. In the immediate postwar period, Army G-2 briefly hosted the Fedden Mission. Third Army remained in Germany until recalled to the United States again in 1947. When back in the United States, its duties were much the same as those of the 1930s, acting as a command and training force for units in the United States. The Korean War saw a repeat of the earlier World War II training duties. The Third Army remained responsible for this aspect of U.S. Armed Forces operations until 1974, when a new major headquarters, that of Forces Command, or FORSCOM was activated to replace Third Army. Third Army was thus inactivated, and it remained so for the best part of a decade. On 3 December 1982, a special ceremony was held at Fort McPherson to mark the return to Active Army status of Headquarters, Third U.S. Army under the command of Lieutenant General M. Collier Ross. Guests at the event included former Third Army Commanders, General (Retired) Herbert B. Powell and Lieutenant General (Retired) Louis W. Truman. The new headquarters was established at Fort McPherson, and its new mission was to serve as the Army component in a unified command, the United States Central Command, which has responsibility over a vast overseas area covering parts of Africa, Asia, and the Persian Gulf. For its part, Third Army could draw upon a reservoir of Army units, and became responsible for planning, exercising, and rapidly deploying these units in crisis situations. It was not until 1990 that Third Army returned to combat. Saddam Hussein invaded Kuwait in August 1990, and American forces were immediately dispatched to Saudi Arabia to protect the Saudi oil fields. Since Saudi Arabia came within the CENTCOM area, Third Army was sent to command the Army units in theatre. At first, XVIII Corps made up the forces assigned to Third Army; enough men to ensure that the Iraqis could not invade Saudi Arabia. However, in November 1990, massive reinforcements were announced in the form of VII Corps from Germany. This deployment marked the largest use of armored formations by the U.S. since World War II, and thus it was fitting that Patton's old command, Third Army, should have control of the battle. By the opening of hostilities, XVIII Corps had three American and one French division and VII Corps four American and one British division under command, thus giving Third Army a total of nine divisions, plus the armored cavalry regiments attached to both corps. Third Army was the main striking force in Operation Desert Storm. Its units were on the left flank of the attacking force and swept into southern Iraq. They then turned east and engaged the Iraqi Republican Guard in fierce combat. Much of that force was destroyed. In terms of its immediate aims, the Persian Gulf War was a stunning success. The Iraqis were ejected from Kuwait and their forces were thoroughly mauled. 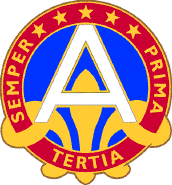 During the crisis, the 22nd Support Command served as the primary Logistics and Combat Service Support organization for ARCENT during the Operation Desert Shield, Operation Desert Storm and Operation Desert Farewell portions of the operation. The Command was activated as the ARCENT SUPCOM (Provisional) on 19 August 1990, but had been in operation since 10 August 1990. The ARCENT SUPCOM (PROV) was redesignated the 22nd Support Command on 16 December 1990. During the conflict, the commander was Major General, and then Lieutenant General William 'Gus' Pagonis. When the Command was disestablished following Operation Desert Farewell, it was succeeded by the 1st Area Support Group. Third Army/ARCENT remained engaged in the Middle East after the end of the Persian Gulf War with various operations to enforce the cease fire. In October 1994, ARCENT was again called upon to command, control, and deploy U.S. Army forces to Kuwait during Operation Vigilant Warrior. The operation was initiated in response to Saddam Hussein’s saber rattling and posturing of Iraqi military forces along the Iraqi-Kuwaiti border. This act of aggression threatened to upset the delicate balance of peace in the region. ARCENT's rapid generation and deployment of a formidable Army force clearly demonstrated U.S. resolve and commitment to its friends and allies in the region. Less than one year later, Saddam Hussein would again deploy Iraqi forces close to its border with Kuwait. In August, Third Army/ARCENT provided command and control for a rapid deployment of a heavy brigade task force. Once more, Iraqi threats were met while ARCENT simultaneously conducted a major training exercise in Egypt, "BRIGHT STAR 95," involving military forces from 6 other nations. This contingency operation validated critical procedures for deployment, particularly the off-loading of equipment from floating prepositioning ships and its distribution to arriving soldiers. The deployment of a "Fly-Away Package" of key contingency staff also validated procedures for a rapidly deployed command and control group able to conduct combat operations immediately upon arrival.The operation was described by Third Army as having convinced Hussein to withdraw his forces from the Kuwaiti border. In September 1996, it was alleged that Iraq violated United Nations sanctions by deploying forces north of the 36th Parallel and attacking ethnic Kurds in Northern Iraq. In response to Hussein's refusal to withdraw his forces, the U.S. launched cruise missile strikes against selected military targets inside Iraq. A heavy brigade task force, 2nd Brigade, 1st Cavalry Division, was deployed to Kuwait under the command of Third Army/ARCENT as follow on forces to an already deployed Task Force (Task Force Headhunter, 1/9th and 1/12th Cavalry) to deter potential retaliatory attacks on Kuwait. The Brigade Task Force was supported by elements of the United States Marines, British Royal Marines and the Kuwaiti Liberation Brigade. Hussein soon capitulated, withdrawing his military forces south of the 36th Parallel. When Saddam Hussein blocked United Nations weapons inspections, tested the resolve of coalition commitment by violating the no-fly zone, and publicly threatened to mimic earlier Soviet successes by shooting down U2 reconnaissance over-flights in the Fall of 1997, CENTCOM responded with a land, sea, and air strike force of more than 35,000 U.S. and coalition forces. In support of this powerful multi-service, multinational ground force, General Anthony C. Zinni, Commander-in-Chief, CENTCOM, established a permanent Coalition/ Joint Task Force (C/JTF), headquartered at Camp Doha, Kuwait, and commanded by Lieutenant General Tommy R. Franks, Commanding General, Third Army/ARCENT. In addition to the U.S. and coalition forces already in Kuwait, a brigade task force from 3d Infantry Division, Fort Stewart, Georgia, rapidly deployed to Kuwait. Departing from Hunter Army Airfield, the brigade task force deployed 4,000 personnel and 2,900 short tons of equipment on 120 aircraft. Within 15 hours of landing at Kuwait City International Airport, the unit had drawn prepositioned equipment and was in battle positions in the desert. On 28 February, Combined Joint Task Force Kuwait (C/JTF-K) was prepared to defend Kuwait with a ground force strength of more than 9,000 personnel. Argentina, Australia, Canada, Czech Republic, Hungary, New Zealand, Poland, Romania, the United Kingdom, and Kuwait rounded out the C/JTF by providing liaison teams, aircraft support, special operations elements, chemical/biological defense, base defense units, MASH units, and medical personnel. Added to forces on the ground was equipment for two more brigades (one Army and one Marine) afloat in the Persian Gulf with the Maritime Preposition Force. These ships were poised to link up with soldiers and Marines who would draw their equipment and begin combat operations if required. Attack air provided by Navy, Air Force, and Coalition assets rounded out this formidable force. This was the largest multinational force assembled in Southwest Asia since the conclusion of the Persian Gulf War. According to the Third Army, the demonstrated capability to quickly deploy combat forces from around the world deterred Iraqi aggression and helped reinstate compliance with the UN Weapons Inspection Program. In November 1998, when the work of the UN inspectors was again interrupted, Third Army quickly returned to the Persian Gulf to convince Saddam that the United States stood ready to enforce the terms of the cease-fire. As Saddam Hussein violated United Nations sanctions and threatened regional stability, the United States began deploying to Kuwait and preparing for combat operations. Combined/Joint Task Force-Kuwait, in place since Desert Thunder I, played a key role in the rapid deployment, reception, staging, onward movement, and integration of forces. Units deploying to Kuwait included advance parties from the 3d Infantry Division and the 32d Army Air and Missile Defense Command (AAMDC), personnel from the Theater Support Command (TSC), Air Support Operations Center (ASOC), and Marine forces. In addition, the redeployment of the Marine Expeditionary Unit (MEU) in the Persian Gulf was placed on hold and a second MEU was ordered to the Persian Gulf as reinforcement. While forces were deploying to the Persian Gulf region, United Nations Secretary-General Kofi Annan flew to Baghdad to meet with Saddam Hussein. Following negotiations, Saddam Hussein agreed to allow uninterrupted resumption of United Nations weapons inspections. In mid-Nov, as the crisis defused, there were 2,300 personnel deployed to Kuwait in support of C/JTF-Kuwait. When Iraqi aircraft began challenging the established no-fly zones, and Iraqi air defense systems fired on allied aircraft in December 1998, US and UK forces responded with a massive display of firepower. Allied air force and navy aircraft, and cruise missiles engaged command and control, communications, and selected Republican Guards targets on the morning of 16 December. These concentrated attacks against Iraqi targets continued until the early morning of 19 December. During the campaign, Third Army again deployed forces to defend Kuwait, and to reassure allies in the Persian Gulf region. By late December, C/JTF-Kuwait consisted of approximately 6,000 personnel, including the 31st Marine Expeditionary Unit. Third Army was deployed to attack Iraq again in early 2003. The forces it had under its command for Operation Iraqi Freedom were much smaller in numbers than those it had commanded twelve years before. It had V Corps as its main striking force, with only two complete divisions and an airborne brigade under that command. There was also I Marine Expeditionary Force, controlling a further two divisions and a brigade. However, numbers were made up for by the advances in technology, which rendered this a powerful force. It took six weeks to defeat Iraq, along with 3rd Infantry Division, the heavy mech/armor component of XVIII Airborne Corps. The aftermath of the campaign saw Third Army headquartered in Baghdad, directing its third occupation within one hundred years. As a result of July 2011 BRAC relocations, Third U.S. Army is headquartered at Shaw Air Force Base, South Carolina with a forward element at Camp Arifjan, Kuwait. Administratively called ARCENT again, it continues to serve as the Army Component Command for CENTCOM, and the forward element is serving as the Coalition Forces Land Component Command (CFLCC). It provides support and services to theater ARFOR commands, as well as directed Army support to other services. Previously, in Saudi Arabia, its bases include King Abdul Aziz Air Base, King Fahad Air Base, King Khalid Air Base, Eskan Village Air Base and Riyadh Air Base. The Army moved all its bases and equipment to Al Udeid Air Base, Qatar in 2003. Focusing primarily on the Middle East, Central Command and Third Army's area of responsibility (AOR) is a large and complex region. It stretches from the Central Asian States to the Horn of Africa. The AOR encompasses an area of approximately 6,500,000 square miles (17,000,000 km2) consisting of 27 countries populated by over 650 million people speaking 12 major languages and representing seven major religions. Within this strategically important region lay the historical crossroads of three continents, the majority of the world's oil and natural gas reserves, and the primary maritime link between Europe and Asia. Resources, differing geography, religious influences, and historical conflict have shaped this region for centuries and continue to do so today. In keeping with US national security strategy, Third Army supports U.S. Central Command through a theater security cooperation strategy that encompasses the four fundamentals of the National Military Strategy. Third Army maintains a continued forward presence, conducts joint and coalition exercises throughout the region, provides humanitarian assistance when needed, develops close partnerships with responsible nations, assists in demining efforts, and provides support to other military service components. Third Army is prepared to rapidly respond by developing and executing war plans and contingency missions as required. This strategy provides the President with a wide range of options to deter aggression and coercion from a forward presence posture, and to decisively defeat any adversary if deterrence fails across the full spectrum of conflict. ^ "Crossing the Rhine," History of the American Third Army, 14 November 1918 to 2 July 1919, Third Army, A.E.F., 2 July 1919. ^ a b Fuller 2004, pp. 254. ^ Christopher, John. The Race for Hitler's X-Planes (The Mill, Gloucestershire: History Press, 2013), pp. 28, 123. ^ "Third Army is reborn as ARCENT". Third US Army. 2007. ^ a b c d e f "Third Army History – Checking Aggression". Third US Army. 2007. ^ "GLOBEMASTER Air Bases Search Engine". Globemaster.de. Retrieved 21 May 2011. ^ "U.S. to move operations from Saudi base". CNN. 29 April 2003. Retrieved 21 May 2011. ^ "Third Army Commanding General's Welcome Letter". arcent.army.mil. 2007. This page was last edited on 22 April 2019, at 12:44 (UTC).